Age 69 of Perry passed away Thursday, January 17, 2019 at Hospice House of Shiawassee County. Honoring Bill's wishes, cremation has taken place. William "Bill" was born May 18, 1949 in Lansing; the son of Robert and Dorothy (Cone) Ross. He graduated from Lansing Everett High School and attended Lansing Community College. 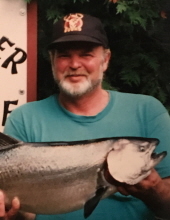 Bill loved the outdoors, hunting, fishing, and anything where he could be outside, enjoying nature. Bill spent his years working for Aunt Millie's Bakery as a Millwright. Bill is survived by his daughter Virginia (Ross) Bolzak; granddaughters Victoria Bolzak and Hannah Bolzak; sister Barbara (Tom) Barnum; several nieces and nephews and many other loving family and friends. He was predeceased by his parents and his brother Douglas C. Ross. To send flowers or a remembrance gift to the family of William "Bill" Ross, please visit our Tribute Store. "Email Address" would like to share the life celebration of William "Bill" Ross. Click on the "link" to go to share a favorite memory or leave a condolence message for the family.